In her words, the "violent fascists, who are waging economic war on the people" will face justice. The country has been rocked by months of street protests against what the opposition sees as an increasingly authoritarian socialist government. Venezuela’s political crisis over installation of a special assembly to rewrite the constitution has pushed forward with Former Foreign Minister Delcy Rodriguez delivering a stern warning to government opponents in her first remarks as head of the special assembly rewriting Venezuela’s constitution. In her words, the “violent fascists, who are waging economic war on the people” will face justice. The country has been rocked by months of street protests against what the opposition sees as an increasingly authoritarian socialist government. Her words were greeted with loud applause from the 545 pro-government delegates who had just begun meeting Friday for the first time. Rodriguez said the all-powerful assembly will commence work Saturday. She didn’t say what lies ahead, but some fellow delegates have been pledging to target opposition lawmakers and remove chief prosecutor Luisa Ortega from office as part of their first order of business. Ortega is a former loyalist who recently broke with President Nicolas Maduro, accusing him of breaking Venezuela’s democratic order. The controversial assembly charged with rewriting Venezuela’s constitution has gotten to work, and its first act of business was selecting former Foreign Minister Delcy Rodriguez to lead the body. The nomination made by socialist party leader Diosdado Cabello was approved unanimously by the 545 delegates. Rodriguez led a cadre of close allies of President Nicolas Maduro who resigned top posts to run for the constituent assembly, which will have sweeping powers to upend institutions and go after the government’s opponents. Venezuela’s pro-government constitutional assembly has gathered for the first time, kicking off the session by singing the country’s national anthem. Delegates marched to the neo-classical legislative palace accompanied by hundreds of red-shirted government supporters. Some were carrying roses and large portraits of the late Hugo Chavez, predecessor and mentor to President Nicolas Maduro. Some shouted, “He’s returned,” as a jab at the opposition, which ordered images of Chavez removed from an adjacent building when it won control of congress in 2015. Leading the procession was first lady Cilia Flores and socialist party leader Diosdado Cabello. The assembly is charged with rewriting Chavez’s 1999 constitution and has been given sweeping powers over other branches of government. Representatives of the South American trade bloc Mercosur will meet to discuss the deteriorating situation in Venezuela. Mercosur suspended Venezuela late last year over what member nations said was its failure to comply with commitments on democracy and human rights. The Brazilian Foreign Ministry said in a statement that the foreign ministers of Brazil, Argentina, Paraguay and Uruguay will meet Saturday. 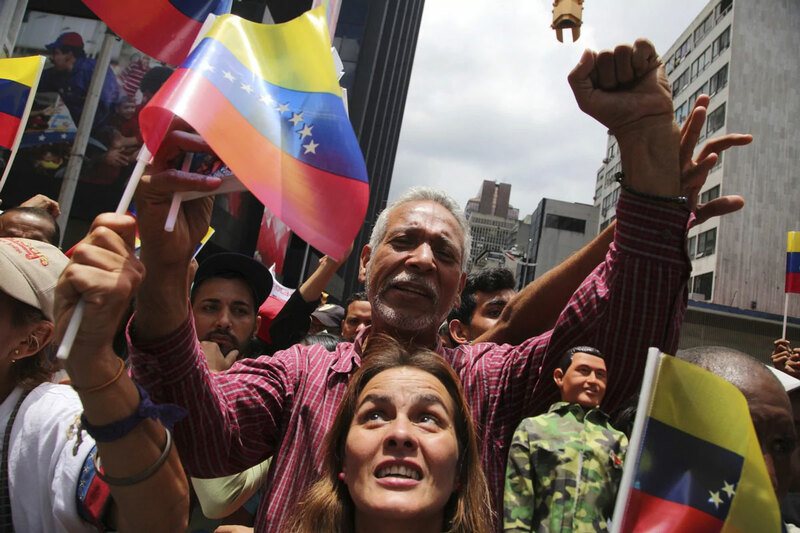 There’s speculation they will evict Venezuela for violating the group’s democratic norms. Venezuela has increasingly cracked down on the opposition and many countries thoughout the region have denounced the allegedly tilted election of a pro-government assembly to rewrite the constitution. Venezuelan President Nicolas Maduro has called the president of Mexico a “coward” – and has gotten a swift response in the same terms from Mexico’s top diplomat. Maduro says a transcript of a January phone call between Mexican President Enrique Pena Nieto and U.S. President Donald Trump showed deference and weakness on the part of Pena Nieto. In the conversation, Pena Nieto repeats courteously that Mexico won’t pay for Trump’s proposed border wall, and Trump urges him to stop saying that in public. The Vatican is urging Venezuela’s government to “avoid or suspend” the new assembly tasked with rewriting the constitution while holding near-absolute powers. President Nicolas Maduro says the assembly is scheduled to start its meetings on Friday. The Vatican message expresses “deep worry for the radicalization and worsening” of Venezuela’s political crisis and for the rising toll of casualties and prisoners from anti-government clashes. Pope Francis invited the faithful worldwide to pray for the country and its people. The message says Francis is closely following the crisis’ “humanitarian, social, political, economic and also spiritual” developments. A prominent Venezuelan opposition leader has been returned to his home after spending several days jailed. The wife of Antonio Ledezma says on social media that the former Caracas mayor arrived home before dawn Friday. Security forces forcibly entered Ledesma’s apartment before dawn Tuesday and took him to a military prison. Officials accused him of violating the terms of his house arrest by posting anti-government messages on social media. Also hauled back to jail for the same reason was opposition activist Leopoldo Lopez. Foreign governments condemned the decision to jail both men, saying it could be the start of a new wave of repression against President Nicolas Maduro’s opponents following a vote Sunday to choose delegates to a special assembly to rewrite the nation’s constitution.